Above & Below: GOSH Golden Dragon shown outdoors with no flash. It's very cold and snowing outside, but try as I might to capture the beauty of this one indoors or outdoors, it's true beauty is not coming through in the photos. Below: Look at the gold in the bottle! Below: Indoors, using an Ott light. Below: Black Passion shown indoors, with and without a flash. 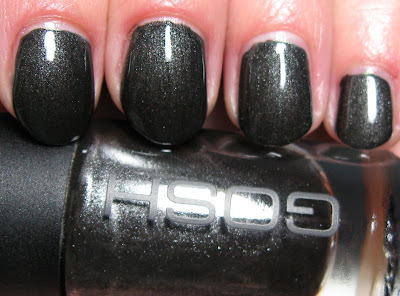 This is a very deep charcoal shade with fine silver shimmer. This one has silver veining in the bottle. Oh. My. GOSH! 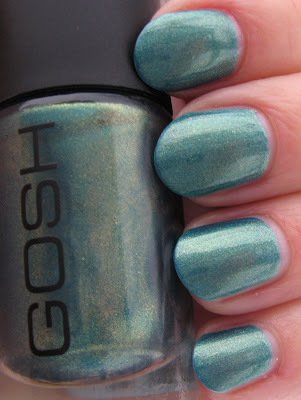 Andrea, one of my followers from Great Britain, sent me my first GOSH polishes last month in an exchange we had arranged. This allowed us both to get some brands that we can't typically get in our own countries. I am thrilled that she chose these, but what I'm not happy about, is that I now want any and all polishes made by this brand! Golden Dragon is unbelievable. 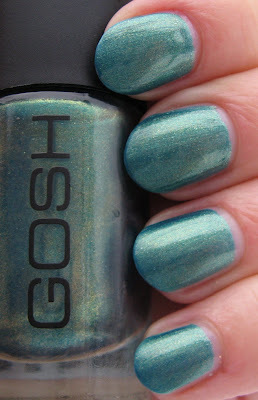 It's a cross between turquoise and teal, with beautiful gold veining in the bottle. On the nail, it has almost a duo chrome effect and fine gold shimmer. I have absolutely nothing even remotely close to this in my collection. 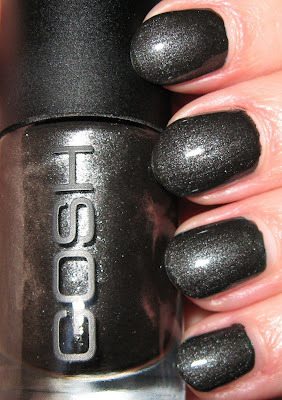 Black Passion is another stunning shade, although I do have some similar shades. One can never have too many shades of charcoal grey, so I'm happy to have this one also. What I loved about Black Passion was the extreme high gloss finish it has. It really helps to define the silver shimmer. Both of these were nearly opaque in 1 coat, although I did use 2 coats for good measure. I don't know of anywhere to purchase these in the U.S., and their web site seems a bit off to me, because it doesn't even show the prices. Thank you Andrea for choosing these for me. You are an excellent personal shopper! Ooo, those are so pretty!!! Oh my Gosh is right! 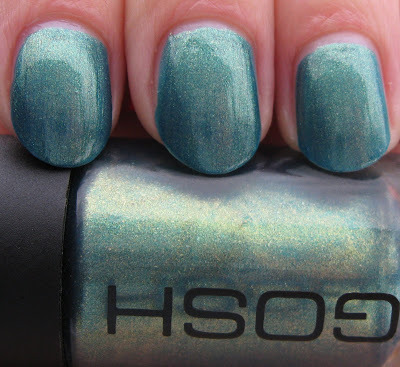 That is one gorgeous polish on you. I love polishes with gold veining as I know you do. The charcoal is fantastic also. Your a dangerous women, making us want more and more! You don't have to push me much. Have a wonderful New Year. 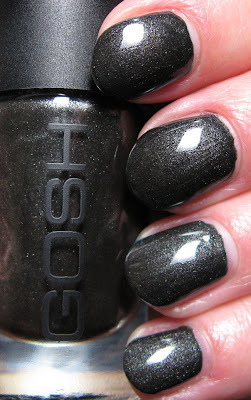 I just got a few gosh polishes today (for once it pays off to live in Finland :D) and Black passion wash one of them. These polishes are the only ones I really like buying from Finland. Black Passion is AMAZING! I have to see if I can find someone to swap that with me. Gorgeous! 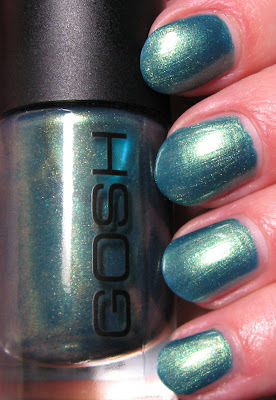 I'm going to try and track some of those GOSH polishes down, they are gorgeous! Evil Angel~I'm just trying to help you out, ha-ha! Glad you like it. gildedangel~I just love them and would love to see more! ~elle~it really is beautiful. Look great in the bottle and on the nail. S~you're lucky you have these, they're so beautiful! Do they have a wide color range? witoxicity~glad you like them! I was really impressed with the formula too! Get Nailed~I'm going on a hunt for these, I just love them. Good luck to you on finding some too! Jennifer~me too! I wonder how many we're going to need! If the rest are anything like these, we may be in trouble. I'm so happy that you like them so much! When I saw Golden Dtagon I knew it was a "Mary" colour! They both look gorgeous on you.